What you’ll do: Lightly coat the sides and bottom of the Dutch Oven with olive oil, then add the potatoes, carrots, onions, chopped bacon, mushrooms, 1 cup shredded fontina cheese, red wine, and the chopped sage. Drizzle the ingredients with the 2 tablespoons of olive oil and season generously with salt, pepper, and garlic powder. Toss with a large spoon until well incorporated. 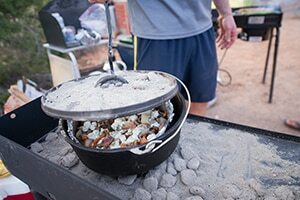 Set the Dutch Oven on 15 to 20 smoldering charcoal briquettes, then add another 15 to the top. Resist the temptation to remove the lid while cooking, doing so will compromise the oven effect. After cooking for one hour, remove the lid and check the potatoes for tenderness. When tender, sprinkle the remaining fontina cheese and crumbled goat cheese on top. Put a goat on it, as we like to say. Let cook uncovered for an additional 10 to 15 minutes, allowing excess liquids to simmer off and the cheese to melt. Garnish with chopped green onion. 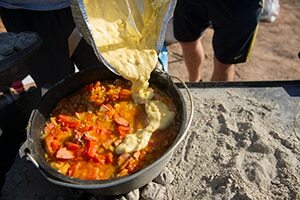 What you’ll do: Lightly coat the sides and bottom of the Dutch Oven with olive oil, then add the bacon, celery, bell pepper, chopped onion, and chopped garlic. Set the Dutch Oven over a full complement of smoldering charcoal briquettes and sauté for 10 to 15 minutes or until veggies begin to soften. Then add the ham, kielbasa, tomatoes, vegetable broth, rice, thyme, rosemary, and spices. Stir lightly, then cover. Reduce the amount of heat by moving about half the briquettes to the outside edge of the oven, then place 15 to 20 briquettes on the top of the oven for even heat. Let cook for about 30 minutes. While the Jambalaya is cooking, whisk the corn bread mix into a thick batter. After 30 minutes, remove the lid and thinly spread the batter across the top of the Jambalaya. Cover and let cook for an additional 30 minutes or until cornbread is golden brown. Best served in deep bowls with a cold beer. What you’ll do: Sift together flour, baking powder, sugar, and salt in a large bowl. Then add the milk, egg, vanilla, and melted butter. Stir vigorously until smooth. Place a greased griddle or fry pan over the stove on medium to high heat, then pour about a ¼ cup of batter on the hot griddle for each pancake. Cook to golden brown on both sides. 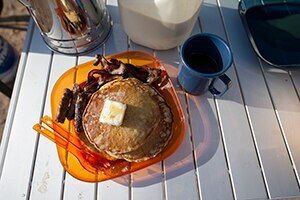 Serve with maple syrup, softened butter, a side of bacon or sausage, and a cup of fresh brewed coffee. What you’ll do: To make the marinade, combine the teriyaki marinade, diced onion, honey, orange juice, sesame oil, garlic, pepper, and rosemary in a bowl or large Ziplock bag. Shake or stir until well incorporated. With a sharp knife, score the flank steak diagonally from two directions on both sides to create a diamond pattern. Place the beef in the marinade for at least 30 minutes before cooking. If you allow the steak to marinate in your cooler for a day or two, it will be even tastier. Set the grill on medium to high heat. Grill the flank steak for 7-10 minutes on either side for medium rare, slightly longer for a medium steak. While the steak is grilling, be sure to baste generously with the remaining marinade. 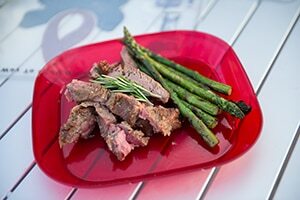 Before serving, cut the flank steak, against the grain, into thin strips and garnish with a rosemary sprig. For the asparagus, lightly brush with olive oil and season with salt and pepper, then grill for 10 to 15 minutes or until tender.